Panic Day is an informal holiday celebrated each year on March 9. It is one of the copyrighted Wellcat Holidays invented by Thomas and Ruth Roy. Panic is a very unpleasant sensation that can lead to sad consequences. Mass panic occurring during public events often results in injuries and even deaths. That is why in stressful situations people try to stay calm and take deep breaths to prevent panic. 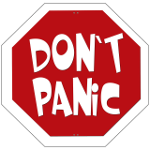 As written on the cover of The Hitchhiker's Guide to the Galaxy, Don't Panic. However, it is very difficult to refrain from panicking and stay calm all the time. Suppressed emotions may result in major freak outs and nervous breakdowns that occur at the worst possible moment. So blowing off some steam is highly recommended. That is why a special day has been set aside, when we are free to freak out and run around all day in panic, telling others we can't handle it anymore. It is unclear why Panic Day is celebrated on March 9, but we guess this date is as suitable for panicking as any other day of the year. You can also use Panic Day for improving your techniques for dealing with panic and learning how to help people who are having a panic attack. These skills might come in handy one day.